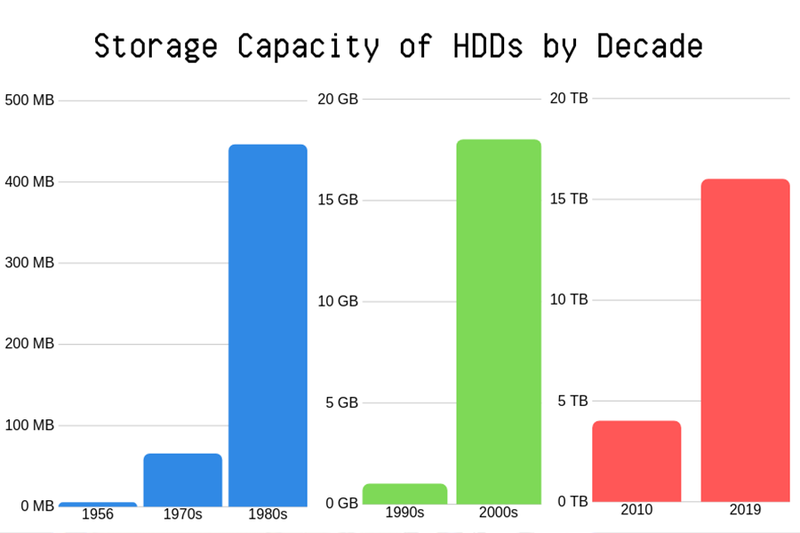 Hard Disk Drives have been evolving in size and capacity since 1956. What began as a 6-foot tall disk storage device with 50 platters has evolved into a Hard Disk Drive with a 2.5 inch platter. Hard Disk Drives (HDD) are hardware devices that store and retrieve data on a computer. They are the central intelligence on your desktop or laptop computer, mobile devices, and many other electronics. How does an HDD Work? A hard drive contains a head actuator, read/write actuator arm, read/write head, spindle, and platter. It has several discs stacked on top of each other that hold your device’s data. Each disc has magnetized metal grains broken down into bits that can move in one of two directions. These bits are symbolized by a binary system of 0s and 1s. Data is written when the strings of bits are converted to electrical currents. These currents are fed through an electromagnet, which changes the direction of the bits. They can then be transformed into useful data on the device. When the HDD begins reading information, the actuator sends a signal to the read/write arm to move the read/write head around the platter in order to find the file location. The more binary units that can be stored on the HDD platter, the more data that can be stored on your computer. Manufacturers are constantly trying to increase the disk space to allow for higher storage capacities. Each hard drive has different data storage capacities, which are broken down into bytes. 8 bits, which are the binary units on the platter, are equal to one byte. A byte is the smallest amount of data while the Terabyte offers the highest storage capacity. The first HDD was created by IBM in 1956 and was the size of a refrigerator. The total storage capacity was 5 MB and only two heads were used to read the disks. The 1970s offered a hard disk drive in much smaller shells with the ability to store roughly 60 MB. The key to this model was the low-mass read/write heads as well as the 8-inch hard disk drives, making the whole unit much more portable. The 1980s began with the Fujitsu brand HDD with a 10.5-inch drive which held a record 446 MB of data. Later in this decade, IBM was on the brink of Gigabyte storage with the first 1 Gigabyte hard drive. Though it offered more storage, it was the size of an engine, as compared to the Fujitsu model which was much more compact. The 90s proved a success for Iomega, who launched the first 1 GB cartridge drive. By 1997, Seagate was moving toward the future with a 9 GB capacity drive. They built upon their success in the 2000s with an 18 GB capacity drive that moved data at top speeds: 61 MB per second. By 2010, Seagate offered a 4TB drive with a sleek design and high speed data transfer rate of 1GB per second. The latest in technology for 2019 is now the 16TB hard drive, which uses Microwave Assisted Magnetic Recording (MAMR) to write to the disk. The MAMR is an innovative approach to writing data onto a disk. It uses a spin torque oscillator on the write head to create an electromagnetic field. This non-heating process differs from the previous Heat Assisted Magnetic Recording (HAMR) which uses heat to more efficiently write to the media but requires extra materials to ensure the heat does not cause data loss. The MAMR requires no surface resistance of the magnetic material and doesn’t use thermal transitions. There are several other ways to backup your information including CDs and DVDs, making a clone of your hard drive, an external hard drive, remote drive, or the more popular option of online storage such as the Cloud. Each has their own pros and cons, as CDs and DVDs are portable, but have little storage room. Making a clone will only be helpful if you continually clone your information on a regular basis. External hard drives hold files before any edits or changes were made, but are susceptible to damage or theft. A remote drive offers convenience, but may run slow depending on the amount of stored data. While online storage systems are constantly available, it can be expensive to back up your data if you have a large capacity of files. No matter what type of drive or backup solution you use, no device is immune to data loss. Our engineers in the recovery lab have decades of experience dealing with all types of hard drives and backup devices. Our research and development team is constantly finding new methods to recover data from all types of drives. They operate out of a Class 10 ISO 4 Cleanroom, which only allows 10 contaminants per cubic foot of space. With the size of hard drives shrinking and the amount of storage increasing, using these standards is the best way for our team to safely and securely recover your data. For more information or to start a recovery case for your drive, call 1-800-388-1266.